Research suggests that exercising during the winter can reduce a person’s chance of catching a cold or the flu. Research suggests that outdoor play can benefit the mental, emotional and physical development of children. A National Trust Survey found that kids aged 10 to 16 spend fewer than 15 minutes engaged in vigorous outdoor activity each day. The Centers for Disease Control and Prevention states children ages 8-10 spend almost six hours a day in front of a screen using entertainment media. 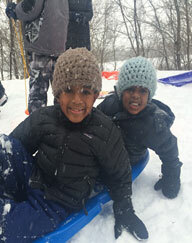 The YMCA of the Greater Twin Cities, a leading nonprofit dedicated to strengthening communities through youth development, healthy living and social responsibility, offers winter camp adventures for everyone to embrace the great outdoors. Research shows proximity, views and daily exposure to nature settings increases the ability to focus and enhances cognitive abilities. The YMCA supports a positive relationship with the outdoors year round by providing opportunities for all to realize the benefits of nature during the winter as well as spring, summer and fall. To learn more about year round YMCA camp opportunities, please visit ymcamn.org/camps. Because the Y is a leading nonprofit committed to helping all thrive, financial assistance is available to those in need. With the generous support of donors such as the Richard M. Schulze Family Foundation and community members, the Y ensures that all have the opportunity to participate. To learn more, please visit ymcamn.org.